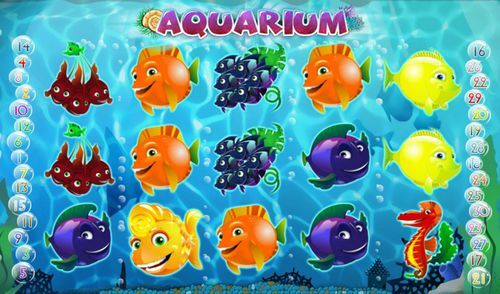 Aquarium is a cute little slot game made by the slots experts at Playson. The set involves three rows and five reels which play across 30 paylines. This game's most valuable symbol is the seahorse, which is responsible for delivering 5000x coins on the line bet when it lands in five instances. 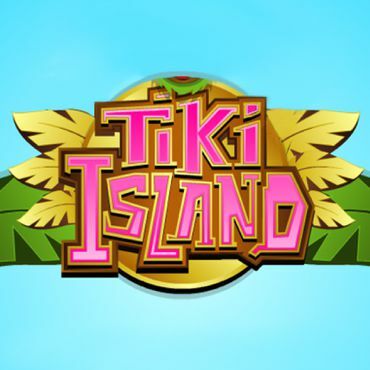 The game has a wild symbol replacing any, except the scatter-bonus symbol, which is responsible for the free spins bonus. 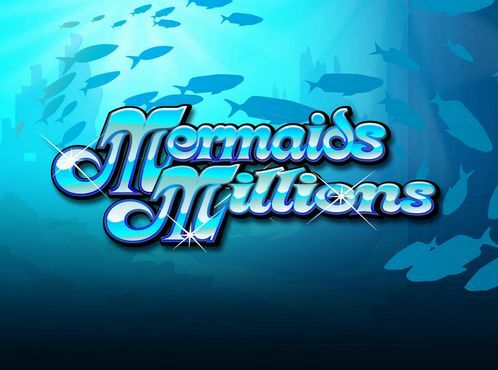 If you are a fan of the underworld and want to be closer to all the creatures living in the water, this is the perfect slot game for you. 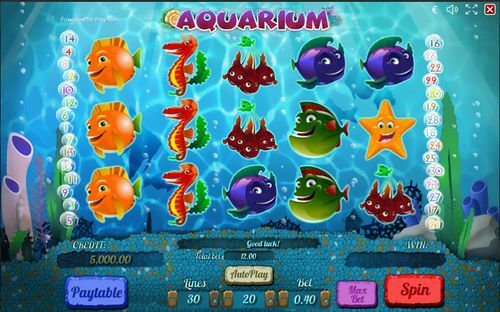 Meet Aquarium Slot, one of the finest online slot games that came out of Playson studios. 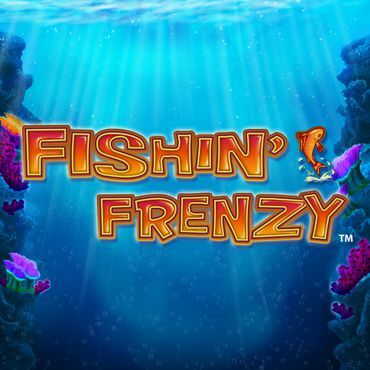 The slot game will dive you to the depths of the ocean and you will play at the very bottom of it. 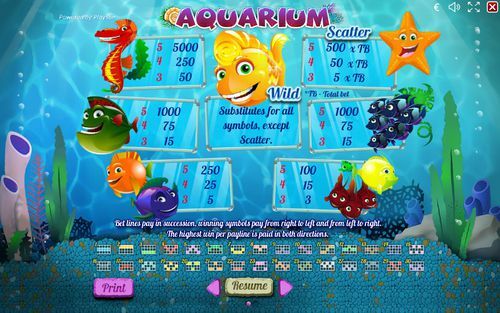 With five reels and 30 paylines, Aquarium Slot is a work of art. You can play it as soon as you select a casino on the side of the article, so see the welcome bonuses before making a choice. To start playing, you need to set the denomination, which ranges from £0.01 up to £90.00 where the maximum amount that you can win is 5,000 coins. The RTP of the slot is 95.53% which is outstanding, but the sad thing is that there are no bonus features in the game, and you have to be satisfied with what it offers in the base game. You can read a bit more about the slot by scrolling down below, of you can select one of the casinos on the side of the article to start playing now. The online slot game will definitely grab your attention with the fantastic screen and the outstanding music, so make sure you turn those speakers up before hitting the spin button. 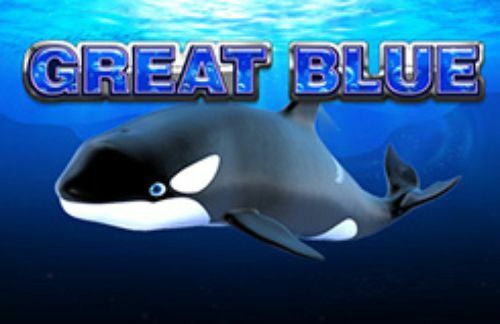 You will see the bottom of the ocean as soon as you enter the game, together with the whole underwater wildlife. The top of the game is for the logo while at the sides, inside a bubble, you will see the paylines of the slot, and if you try to mouse over them, they will appear on the screen. At the bottom, you will see the adjustable options of the slot like the number of lines and the bet. You can also find the Auto Play and Bet Max features which are at the bottom, right next to the big red Spin button. As we already mentioned, the slot game has fantastic music, so turn those speakers up before spinning the reels. All of the symbols in the slot are related to the underwater theme, and we can see a seahorse, fish of various colours like green, orange, blue and yellow, and two separate shoals. Paylines run from right to left as well as left to right so there are plenty of winning options. The wild symbol is a big, cheerful goldfish which will substitute for all others to help make winning combinations except for the scatter. That’s a starfish which will pay as long as you can land at least three anywhere on the reels. To start playing this online slot game with five reels and 30 paylines, you need to select a casino which has the game in its arsenal of slots. The casino plays a major role in your gameplay as you will spend all of your time on the pages of the casino. The casino will also be responsible for your deposits and withdrawals, and they will hold your personal and banking information, so you want to find a safe and secure site to play at. Once that’s done, you need to set the denomination of the slot, which ranges from £0.01 up to £90.00 where the maximum jackpot of the slot is 5,000 coins. You can play the game with an RTP of 95.53% which is above the average RTP mark. As there are no bonus games in the slot, you can use the Auto Play and Bet Max features which are next to the spin button. The Auto Play is a feature which will set the reels of the slot game spinning automatically. All you need to do is select the denomination and the number of spins that you want the game to spin, and you are ready to go. Keep in mind that you can always cancel the feature and proceed manually. On the other hand, the Bet Max is a more dangerous feature which needs to be played with a lot of care. It sets the denomination, coin value and level of the game all the way to the maximum, and it will also activate all of the paylines of the slot. You need to have a plan or a limit to your money before playing this feature, or we suggest you completely neglect it. 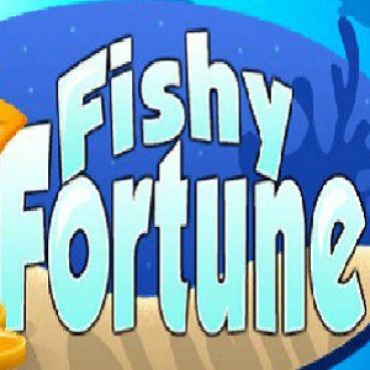 Find a casino with Aquarium Slot in it, make sure you deposit to get the welcome bonus and enjoy the game.